A view of the bust on the front of Secular Hall. 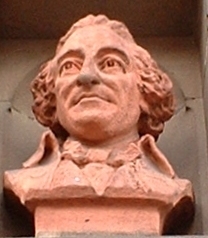 Tom Paine worked variously as a staymaker, teacher and exiseman and became involved in organising labour and trying to negotiate better pay and conditions. As a result he lost his job and, on the advice of Benjamin Franklin, emigrated to America in 1774, where his book Common Sense (1776), and other writings arguing for republican government and independence were influential in the American revolution. Congress and the State of New York recognized his services by a grant of land. He returned to England with a view to having his design for an iron bridge built, but the French revolution of 1789, and the writings of Burke against it, inspired his very influential book Rights of Man (1791-2). William Blake, the poet, warned him to escape to France before being charged with treason. There, since he argued against the terror, he fell foul of Robespierre and while in jail wrote his anti-religious work the Age of Reason (1793-4). He returned the United States in 1802. Scandalously his bones were dug up and brought to England by Cobbett in 1819, but were then lost. Some of the pages referenced by these links have disappeared (or have changed and lost their relevance) since George Jelliss added most of them several years ago. In the meantime new resources have become available. Please do contact us (details on our homepage) if you have any updates or suggestions for this page - or any other part of our website. Making History: Thomas Paine. Saleha Ali of WorldBytes and Cheryl Husdon of the Rothermere American Institute, Oxford. Thomas Paine Friends, Inc - newsletters and pictures of monuments from around the world, etc.